Figure 1- The discovery image taken by Cassini where the arc of material disrupted by the moon is the bright bump at the bottom edge of the otherwise smooth ring. Everyone knows Saturn’s ring system- the dazzling rings made up of clumps of water ice stretch tens of thousands of kilometers in space, and are an ideal dynamical laboratory to see how objects in many different disks can form and evolve (such as circumstellar disk). 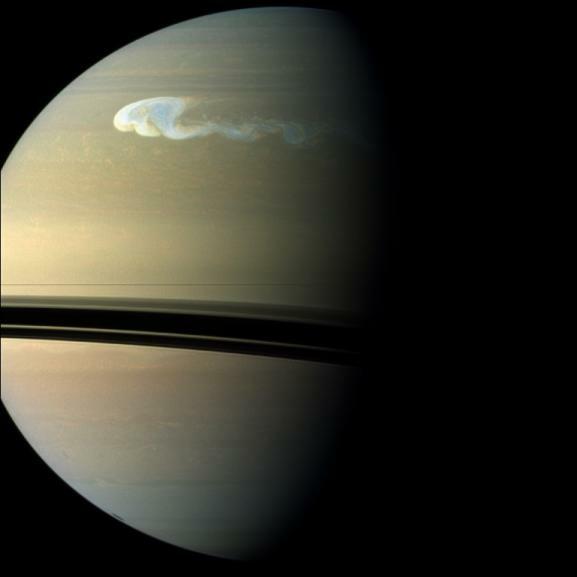 Another huge advantage to studying the rings is we can actually go there- a detail that makes every astronomer who has squinted at a faint faraway blob in their images incredibly jealous- and in fact the spacecraft Cassini has been orbiting Saturn for a decade now. This has allowed astronomers and planetary scientists the chance to not just snap thousands of stunning images of the rings but also study how they evolve over several years… and in this case, even witness what appears to be the birth of a new moon from the ring system! Here’s how it happened: on April 15, 2013, Cassini took a series of images intended to improve orbital information of Saturn’s moon Prometheus, which also included views of the A ring, which is Saturn’s outermost bright ring. From this series of images astronomers noticed the picture happened to include a feature in the A ring unlike anything seen before- an arc of material approximately 20% brighter than the material around it approximately with a maximum width of 10 kilometers. Further, it was seen in two images taken 33 seconds apart, negating the odds of it being a fluke due to a cosmic ray or similar. Old images were reexamined; the object was in the images from at least May 2012 and showed possible disruption in early 2013. So what was it? The authors concluded that these observed features were the result of an unresolved object near the edge of the A ring that was causing this disruption. From modeling the orbital dynamics and trajectories in the ring system, it appears a sub-kilometer sized object would be enough to accomplish this. Such a new moon is too tiny to be imaged, but would gravitationally interact with material on the edge of the A ring and this is what created the extended arc in the otherwise smooth edge of the ring. Further, astronomers believe such an object would have coalesced in the ring as the water ice particles clumped together, and then migrated outward to cause these outer edge ring disruptions observed for the first time in these images. Such observations could be invaluable to planetary formation theory, both in terms of how Saturn’s known icy moons formed in the past when the rings were larger and how such icy moons could form around other planets. Cassini’s orbit around Saturn will take it much closer to the A ring in early 2016- hopefully close enough to image the new mini-moon. Stay tuned!